One of the most beloved members of the Looney Tunes and Merrie Melodies casts, Daffy Duck also possesses one of the most difficult personalities to pin down. With almost every animator that worked for the Warner Brothers studio tweaking him to their specifications, he’s run the gamut of characters, from violently unhinged to a screwball comic. For generations of kids, there are lessons aplenty to be learned by observing Daffy; here are ten of them. A Small Start Can Turn Into Something Big – Kids can learn the power of a small start from looking at the history of Daffy Duck; from his very humble beginnings in 1937 Porky Pig short, Daffy became the most popular character in the Warner Brothers stable. Though he would later be eclipsed as a fan favorite by newcomer Bugs Bunny, he certainly enjoyed a lengthy reign before the “dethpicable” rabbit’s introduction. Imitation is the Sincerest Form of Flattery – The unmistakable voice of Daffy Duck was created by the great voice actor Mel Blanc and inspired by the real-life tone of Warner Brothers producer Leon Schlesinger. Sometimes, being imitated is a sign of being appreciated. You Can’t Always Be Number One – As previously mentioned, Daffy rode the wave of popularity for quite some time before being ousted by newcomer Bugs Bunny. This natural succession allows kids to see that even the most popular can lose their edge, and that the crowd can be fickle. Sometimes Your Enemies Turn Out to Be Your Friends – Despite years of intense rivalry and anger, Daffy Duck’s character is now best friends with Bugs Bunny. Their days of mutual torment long behind them, they’ve learned to play nice after giving one another a second chance; there’s a strong lesson about acceptance and second chances for kids. Even The Good Guy Can Play the Villain – Kids watching Daffy’s performances can learn that even the good guy can sometimes be bad, and vice versa. Human (or cartoon duck) nature is very rarely straightforward and immutable; we all have good and bad sides. 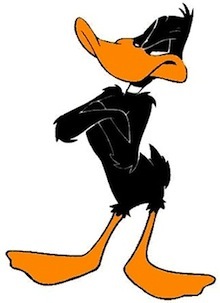 Things Come Full Circle – Though Daffy has never enjoyed the popularity he knew before the introduction of Bugs Bunny, he has been portrayed in recent years as a character much closer to his original self. Seeing the evolutionary process of his character teaches kids that things are fluid, and often come full circle. Bad Guys Really Do Finish Last – Though he’s certainly not always a villain, in the shorts starring Daffy as a ne’er-do-well, he’s always foiled by the well-meaning protagonist. Watching Daffy’s harebrained schemes fail is a great way for kids to learn that resorting to “bad guy” methods won’t help you win. Hard Work is the Only Road to Success – The Looney Tunes Show, picked up by the Cartoon Network, introduced a younger generation to the beloved Warner Brothers characters through new animated shorts. By watching this series, kids learn that all of Daffy’s “Get rich quick” schemes are useless, and never pan out. Through his antics, kids see that the road to true success is paved with hard work, not dumb luck. We Should All Do Our Part – Like other Looney Tunes and Merrie Melodies stars, Daffy Duck starred in several shorts during World War Two that supported the war effort and the troops. Looking at the history of Daffy’s character, children are taught that we all have to chip in during tough times. Fair Weather Friends Aren’t True Friends – Seeing Daffy portrayed as, at best, a fair weather friend to co-star Speedy Gonzales teaches kids that true friends stick together in good times and in bad. Daffy and all the Looney Tunes characters have plenty they can teach kids about getting along in life.